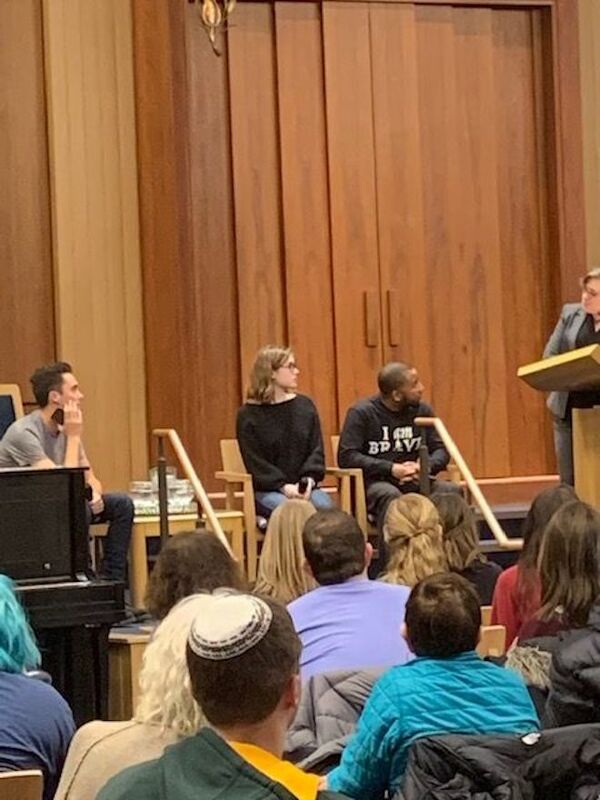 This Thursday, Stoneman Douglas High School shooting survivor David Hogg hosted a panel to discuss gun violence in the U.S. joined by local high school student Mollie Hartenson and Violence Prevention Coordinator of the BRAVE Youth Leaders Lamar Johnson at Beth Emet The Free Synagogue. In his opening remarks, Hogg remembered Joaquin Oliver, one of the 17 victims of the Parkland shooting that took place last February. “I fight for him,” Hogg said. Hogg believes that two important measures must be taken to reduce gun violence. First, mental health care and treatment must be improved in and out of schools, especially for men, given the stigma against them expressing themselves on an open and emotional level. Second, new legislation needs to address the source of gun violence, the weapon itself and who has access to it. The crucial first step to achieving this, Hogg explained, is to counter the National Rifle Association (NRA) and other gun lobbyists. Hogg also decried certain media outlets’ usual response to calls for gun control following mass shootings. Near the end of the event, the panel took questions from the host and audience. When asked about the difficulties of a youth movement, Hartenson explained that since it is primarily led and organized by youth, the gun control movement is often seen as lacking legitimacy, but she stressed that it does not make the message of a safer community any less important. The fact that the movement is made of people from greatly varying racial, ethnic and socio-economic backgrounds, Johnson added, gives their cause strong legitimacy. Making a quick appearance, Illinois Rep. Jan Schakowsky congratulated the panel for their continued efforts to reduce gun violence nationwide. Schakowsky mentioned efforts being made in Congress to pass the Bipartisan Background Checks Act of 2019. This act, which is scheduled next week for consideration, would use the background check process to prevent individuals prohibited from having a firearm from obtaining one. Throughout the event, the panelists emphasized the need for unity and persistence. Hartenson explained that it’s not enough to participate in a single walk or have a sign on one’s lawn. Change does not come from passive opposition. Hogg stated that it is not a Democratic issue or a Republican issue. It is a violence issue.